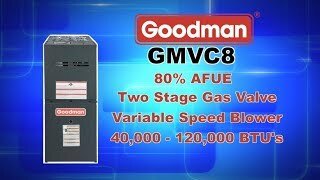 The Goodman GMVC80 furnace features a two-stage burner with a variable blower motor. This furnace can be installed in both upflow and horizontal configurations and features an aluminized-steel tubular heat exchanger and durable Silicon Nitride Hot Surface Ignition system. The Goodman GSX14 Air Conditioner Condenser uses the chlorine-free refrigerant R-410A to help prevent damage to the Ozone Layer. This unit is equipped with sound-dampening features to provide operating sound levels are among the lowest in the heating and cooling industry. Using high-quality components, the Goodman GSX14 air conditioner condenser is rated at 14 SEER and will help reduce energy consumption throughout the life of the system. The Goodman CHPF Cased Indoor Air Conditioner Evaporator Coil is made for use with split-system air conditioning and Evaporator systems. The Goodman Air Conditioning and Heating Company has become one of the largest manufacturers of residential and light commercial air conditioning, heating, and indoor air quality products and systems by focusing on just one thing, building the most reliable and refreshingly affordable indoor comfort products in the market. The Goodman GMVC80604BN furnace features a two stage gas valve, variable-speed blower motor, and provides exceptional indoor comfort and quiet operation. This furnace is compatible with the ComfortBridge communicating system and is designed for uplfow or horizontal configurations. 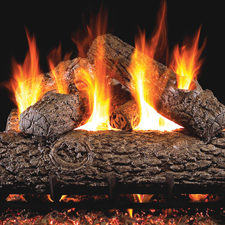 These furnaces are run-tested for heating or combination heating and cooling applications. Not intended for use in mobile homes. The Goodman GMVC80604BN furnace has a 80% AFUE rating which means that for every every $1.00 you spend, 80 cents goes towards heating your home. Low constant fan speed allows homeowner to activate a very low speed, efficiently circulating air throughout the home. This setting costs as little as a 100-watt light bulb to operate. 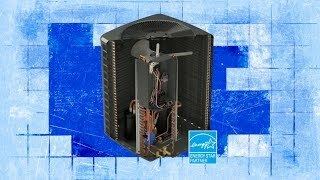 The GSX140361 Goodman 3 Ton AC Condenser uses the chlorine-free refrigerant R-410A to help prevent damage to the Ozone Layer. This unit is equipped with sound-dampening features to provide operating sound levels are among the lowest in the heating and cooling industry. Using high-quality components,the Goodman GSX140361 air conditioner condenser an be either 14 or 15 SEER depending on which indoor unit it is paired with. 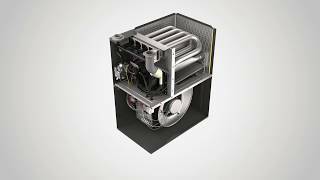 If it is installed with the manufacturer-recommended evaporator coil, variable speed furnace, variable speed air handler, or variable speed modular blower, and also sometimes a thermostatic expansion valve (TXV), it is a 15 SEER system. Click here to see the unit that is available in these states. Goodman's TXV valves are designed to improve the reliability and efficiency of your central split system. With the TX3N4, you can be assured that your two-and-a-half or three ton system is getting the proper refrigerant flow, even through changing conditions. Since this valve is installed externally, it is easy to service and maintain. If you're looking to improve the efficiency and performance of your system, the TX3N4 is a good start. I'm glad I added it. This was the first time adding a TXV kit. I was reluctant because you could just leave the unit with the standard set orifice. But, now 7 months later, it's been working fine. It makes sense to put one, just like a thermostat for a car. It makes things run consistent on the output.